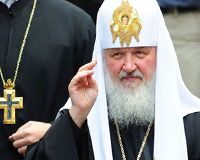 On July 26-28, Patriarch of Moscow and All Russia Kirill to pay a visit to Ukraine, the press secretary of the primate of the UOC Archpriest Heorhiy Kovalenko told a press briefing, ForUm correspondent reports. “His Holiness Patriarch is expected to arrive on July 26, approximately at 10 a.m. First, he will go to the Lavra monastery, where he will meet with His Beatitude Metropolitan Volodymyr,” he said. According to Kovalenko, on the same day the Holy Synod of the ROC will be started, which will continue on July 27 and will end with the prayer service at St. Volodymyr’s Hill. He also said that on July 27, the solemn celebration of the 20th anniversary of the primatial ministry of Metropolitan Volodymyr will be held at the Palace “Ukraine”. During the event, a film showing the changes in the Church in Ukraine over the past 20 years – from 1992 will be presented. Kovalenko said that on July 27 on the day of the Christianization of Rus, Metropolitan Volodymyr and Patriarch Kirill are to meet in Kiev-Pechersk Lavra and conduct Divine Liturgy in the square before the Cathedral of the Assumption. These events will be attended by the representatives of 13 out of 15 local Orthodox churches in the world – those of Constantinople, Alexandria, Jerusalem, Georgia, Cyprus, Bulgarian, etc.